The Centre for Communication and Social Impact (CCSI), formerly known as Center for Communication Programs Nigeria (CCPN) was registered in 2001 as a Non-Governmental Organization with the Corporate Affairs Commission of Nigeria. Birthed in Nigeria by the Johns Hopkins Center for Communication Programs (JHCCP), Baltimore, USA, CCPN transitioned its operations under the new name CCSI after an exciting 10 years of growth and operations in Nigeria and other African countries. Our new name clearly communicates our expanding portfolio and identity as an indigenous Nigerian NGO. Centre for Communication and Social Impact (CCSI) reflects our ambition as we look towards our growing future and the plans we have in contributing to Nigeria’s development and the African continent. Set to inspire change, we believe that communication saves lives. (who we are) and what we bring to work everyday. We are disciplined, accountable, transparent, honest and reliable. We are goal-driven and purposeful. We work as a team. We are creative, always learning, versatile and cutting edge. We are supportive of one another and respectful. Though trained as a pharmacist, Babafunke has had over 25 years of illustrious career, developing, implementing and managing strategic health communication initiatives in various thematic areas of integrated health and social development. She is globally acclaimed as one of the leading lights in Africa on Social Behaviour Change Communication and as one of the very few experts, she has dedicated much of the past 10 years in building the next generation of health communicators. As founding Executive Director, Babafunke is key to the operations of CCSI, providing the much-needed guidance and direction in all thematic areas. She is actively involved in the running of the projects and works as a part of the CCSI team, leading by example. Babafunke has brought her easy-to-do approach to the annual Leadership in Strategic Communications Workshop which she has facilitated since 2008. The workshop, a cornerstone in CCSI capacity building mission currently draws participants from other parts of Africa and has established itself as a unique opportunity for health and development communication professionals. Up till 2003, she served as the Program Director, Staywell Foundation. She has worked on key health and development projects in Nigeria including the Johns Hopkin’s Bloomberg Center for Communication Programs SuNMaP project, National Communication Consultant PATHS1, Communication Consultant Netherlands Leprosy Relief, Principal Investigator UNFPA. She has a Master of Business Administration from the University of Liverpool, Masters of Communication Arts from the University of Ibadan and she is a member of the Pharmaceutical Society of Nigeria. Babafunke says: “I feel so blessed to have had the support of such a dynamic team, working with me from inception till now. The wonderful staff are the epitome of what CCSI represents; Excellence, Integrity, Passion, Innovation and Care. In the past 25 years, Macaulay has enjoyed a career as a Sustainable Development Specialist with considerable experience in organisational leadership, development programme management and institutional capacity building. Over the years, he has worked in various capacities with donor-funded development projects and the private sector, notably the Shell Petroleum Development Company, Nigeria where he was at one time, the Coordinator of the Company’s Sustainable Community Development department’s health, education and monitoring and evaluation programmes and later, the Head of Partnerships Implementation. He was Programme Manager with the Living Earth Foundation, United Kingdom, where he worked with local implementation partners to improve governance across public institutions in Southern Nigeria. He also established community development programmes in Ethiopia, Mali and Zimbabwe as the Community Development Advisor for the Society for the Protection of Animals Abroad (SPANA), London. He volunteers and reads autobiographies in his free time. Oluseyi brings over 20 years’ experience in community development practice, community system strengthening and other public health and social development issues including Malaria, Nutrition, Reproductive Health, Family Planning, and Governance. He has technical and management experience in development and participatory methodologies with specific expertise in strategic health communication interventions. A competent facilitator in Participatory Rural Appraisal (PRA) methodologies and group promotion. As the Technical Advisor, he provides oversight to projects currently being implemented by CCSI both at state and national levels, while also providing supportive supervision to ensure projects meet expected deadlines and results. Oluseyi’s views community activities as a way of giving back to the societies. He is especially happy when CCSI’s interventions make differences in the lives of community members. As one of the longest-serving staff, he considers the CCSI team as family. Oluyemi’s expertise are in the areas of Development Communication, Behaviour Change Communication, Maternal Health, Adolescent and Reproductive Health. For over 15 years, he has deployed these skills to bring positive change in advocacy, media relations, community mobilization, conflict resolution and peace management. He joined CCSI in 2011 as a Programme Officer in charge of the Urban Reproductive Health Initiatives (NURHI) and has since managed several other projects rising to become a Technical Advisor on all of CCSI major projects. His leadership skills has seen him leading many of CCSI projects including the Health Communication Capacity Collaborative (HC3) where he supervised extensive community mobilisation outreach, BCC material development, documentary productions etc. As Technical Advisor, he manages and supervises projects across different thematic areas. Oluyemi has a degree in Mass Communication and a Master’s Degree in International Relations and Strategic Studies. He is an alumni of the prestigious Leadership in Strategic Health Communication (LSHC) by the John Hopkins University, Bloomberg School of Public Health. He sees CCSI has a learning organization which has given him room to grow in his area of expertise. In his free time, he likes to hike and photograph nature and landscapes across the globe. Adolor brings vast and rich experience to CCSI as a public health evaluation specialist with experience in social and public health research, knowledge management; monitoring and evaluation of development projects. Having worked in different public health and social development sectors including HIV/AIDS comprehensive care, Orphans and Vulnerable Children (OVC) care, Education, Health Systems strengthening, Cervical Cancer prevention, Malaria, and Maternal, Neonatal and Child Health (MNCH), he has developed numerous research protocols and survey tools, coordinated operational/formative research studies and evaluations of donor funded projects; and conducted scientific/ technical documentation; he is an expert in coding and analysis of quantitative and qualitative data. Adolor’s leadership work in developing state Monitoring and Evaluation plan for Lagos state government saw a more efficient project monitoring and evaluation in the state and he also provided a much needed technical assistance to the programme branch of the National Malaria Elimination Programme of Nigeria’s Ministry of Health. He is a Certified Knowledge Manager (KMI, USA) and Member, American Evaluation Association (AEA). As the Technical Advisor Research, Monitoring, Evaluation and Learning, he oversees research designs and implementation, generation and management of evidence to guide designs of SBC strategies across CCSI projects. He provides technical leadership for the knowledge management systems at CCSI. Adolor is a fan of traditional gospel music. Moses is CCSI Senior Finance Officer, overseeing the finance department. In this role, he has brought immense innovation and expertise to bear on our financial process. He has a first degree in Accounting from the University of Jos and an MBA from Nasarawa State University. He joined CCSI shortly after and for the past 10 years, he has been part of the core team of innovators who witnessed the various stages of development of CCSI. He is a fan of varied genre of music and loves traveling. Before joining CCSI, Seun has worked as one of Nigeria’s top investigative journalists for 17 years and has helped to highlight the plight of the underprivileged people through his commitment to development journalism. With a Diploma in Journalism and a Degree in History and International Relations, Akioye began his career in 1999 at The Week magazine and rose to become Assistant Editor at The Nation newspaper before joining the CCSI team as Senior Media Officer. Under his leadership, the Media and Creative Units help to highlight the works of CCSI in a creative and innovative way. He is one of Nigeria’s most decorated journalists with more than 15 national and international awards to his name including the Wole Soyinka Investigative Journalist, Nigeria’s Writers Award, Writer of the year, Nigerian Media Merit Award (NMMA) Journalist of the year in Investigation, Environment, Foreign, Arts, Diamond Excellence Award (DAME) Development Journalist, Nigerian Breweries Golden Pen Reporter etc. As Defence Editor, he has served time covering the Boko Haram insurgency in Nigeria’s northeast and two terms of reporting the war against Al-shabab in Somalia. He also covered the 2008 US Presidential Election. He is also a well sought after public health speaker and has spoken at many international meetings in the United States of America, Canada, United Kingdom, India, Australia etc. He helped draft and implement legislative advocacy for the passage of Nigeria’s tobacco control laws. Akioye loves adventure, travelling and cooking. Anthony brings to CCSI over 12 years of experience in the management of public health programs on maternal health and child survival interventions. Over the years, he has managed donor funds amounting to over $15 Million on about 12 projects and contracts supported by Global Fund DFID/UKAID, USAID and other Institutional donors. Anthony has worked with CHAN Medi-Pharm, Sustainable Healthcare International and Christian- Aid, UK before joining CCSI. As Senior Program Officer, he supports the coordination and integration of resources from donor agencies and other corporate bodies into targeted public health Social Behaviour Change Communication interventions across the states to improve the health of the population. Anthony holds a BSc Microbiology from University of Benin, a Master of Public Health (MPH) from University of Ibadan and currently enrolled with London School of Hygiene and Tropical Medicine, University of London MSc Health Services Management International Program. He has certifications in Malaria (PH425x: MalariaX: Defeating Malaria from the Genes to the Globe) with Harvard School of Public Health and Project Management for Development Professionals (PMD Pro 1&2) from AMPG International, UK. He is an alumni of the prestigious Leadership in Strategic Health Communication (LSHC) by the John Hopkins University, Bloomberg School of Public Health. Anthony has expertise ranging from Project Management, Health System Strengthening and Community Mobilization. Anthony believes the work culture at CCSI is helping him to deploy his skills in achieving results. Opeyemi (a seasoned Chartered Accountant) has offered about twelve (12) years in practical experience in the field of ICT driven audit, forensic accounts, tax administration, amongst others. He has worked with renown companies in the financial sector including Finbank Plc, M&D Holdings Ltd, Fasol Engineering Ltd, and Omolola Iyabode & Co, audit firm and has experience in consulting for Government’s Ministries, Departments and Agencies (MDAs). All of this wealth of knowledge, he brings to bear on his position as the Internal Auditor at CCSI. At different point of his work with CCSI, Opeyemi has audited the USAID – Health Communication Capacity Collaborative (HC3) Malaria Project Funds for Social Behaviour Change Communication (SBCC) in five Nigerian states, the Bill & Melinda Gates Foundation (BMGF)’s funds for Nigerian Urban Reproductive Health (NURHI) project in Kaduna state, United Nations Children Fund (UNICEF) IPCI training project funds in Maiduguri, Borno State, UNICEF VAC in 5 states of the federation among many others. Opeyemi is an alumnus of the Strategic and Business Development Workshop by the John Hopkins University Center for Communication Program Baltimore USA and Team Building International as well as HACT (Harmonized Cash Transfer) workshop. He is a graduate of Accounting from University of Ado Ekiti and a member of the Institute of Chartered Accountant of Nigeria (ICAN). Adenike works as CCSI Programme Officer, providing support to projects implementing strategic behaviour change interventions in Nigeria. She currently supports Family Planning programming on the NURHI 2 project but also provides support to other thematic areas across health and social development. She has extensive work experience in the health sector both in Nigeria and the United Kingdom where she worked in the Cervical Cancer Screening Programme of the National Health Service UK. Adenike has spent the last 13 years helping to improve the health indices of the most vulnerable people and was instrumental to the successful implementation of the NURHI project which concluded in 2015. She has a Degree in Biomedical Sciences from the University of WolverHampton and a Masters in Translational Medicine from Cranfield University in the United Kingdom. Adenike is also a baker, who loves to read in the process. Precious has together about 14 years of experience as a public health and social development worker. Since 2011, Precious has coordinated the flagship and highly successful leadership training programme of CCSI the Leadership in Strategic Communication Workshops (LSCW). Her expertise and leadership has proven valuable over the years and has contributed immensely to a successful delivery of all the editions held for the last seven years. She also supports with CCSI’s specialized trainings and team building exercises. Precious holds the Bachelor of Pharmacy (B. Pharm) degree of the prestigious Ahmadu Bello University, Zaria, a Master of Public Health (MPH) degree from the Public Health Department of the Faculty of Medicine, University of Glasgow, Scotland and a Doctor of Public Health (DrPH) degree (in view) from the Walden University, United States of America (USA). In addition to her training portfolio, she has supported the implementation of several CCSI projects like Nigerian Urban Reproductive Health Initiative (NURHI 1), Family Planning Providers Network (FPPN), Micronutrient Initiative, NetCare and repair, UNICEF IPCI, UNICEF End Violence Against Children, NURHI 2 Post Pregnancy Family Planning project etc. She supports in the development and implementation of communication strategies which has served as a link to the determinants of behaviour which directly or indirectly impact on positive behaviour change. She is a member of the Pharmaceutical Society of Nigeria (PSN), the United Kingdom Public Health Association (UKPHA) and the American Public Health Association (APHA). Fatima encapsulates skills in law and communications. A lawyer by training, she has worked in the field of development and media using communications to illustrate changing behaviours. She has written and produced media contents including documentary and short drama series aimed at bringing about change in target audience behavior and attitude on the web and electronic media. Over the years she has horned her skills in team coordination, content research for programs, creative writing and script editing, programme research and coordination, public and media relations and leadership and management. At CCSI, she coordinates all project activities relating to The Challenge Initiative (TCI) which focuses on Family Planning. Fatima has consulted for UNICEF and has extensive work experience with the BBC Media Action as Project Manager, Head of Training, Content Research and Edit Leader, Producer and Script Editor. She obtained her Law degree from the University of Maiduguri and attended Lagos Law School. As a member of the Media and Creative Unit, David works closely with the Senior Media Officer to plan and execute media related tasks including proofreading, creating and monitoring media contents. A graduate of Journalism, David brings a wealth of experience to the team both as a print and multi-media journalist. A Google certified journalist, he began his career as an Editorial Assistant at TELL Magazine and later moved to The Nation Newspaper as multimedia Journalist and Social Media Executive. David is a member of Nigerian Union of Journalists, Journalists for Christ, Code for Nigeria, Africa Press Team, Voice of Children Africa (VOCA), Africa Press Team and Global Editors Network. He is a member of the inaugural UNLEASHLAB talents in Copenhagen, Denmark to find innovative solutions to the Sustainable Development Goals. He was a writer for High Society International Magazine in Birmingham, UK; Country Representative for Foreign Direct Investment in Nigeria Magazine, Media Relation Officer to Association for Credible Leadership in Nigeria (ACLN) Bogotá, Colombia and Editor at AllMotors Newspaper, Lagos. David says, “CCSI provides every form of support that makes you grow in your social life, career path and all around. Candidly, I like that my creative mental horizon is being challenged and is improving by the day, thanks to CCSI’s dynamism.” He likes reading, tourism, surfing the internet and playing music. He is a graduate of the prestigious Nigerian Institute of Journalism and the Lagos Business School. Habeeb works closely with the media and creative team to develop engaging documentaries and stories of change across CCSI areas of focus that would be used especially for community and media engagement. He is a trained broadcast content producer by profession, graduate of Ahmadu Bello University Zaria, Nigeria Television Authority (NTA) College Jos with major in TV production. He has highly advanced storytelling and skill set for content production with a clear and original vision of the projects he creates. Over the years, he has had the privilege to work on several development projects, with ample experience in implementing community-based programmes and activities for peace development among local communities through theatre, music and other forms of art. Among his best work: ANOTHER CHAPTER (Short Docu-Drama); Nominated for NUFF (Norwegian Youth Film Festival) and screened at ANIWA International Film Festival Ghana; NAKED TRUTH a short film that won the best short film in Zuma International Film Festival; FAR FROM UTOPIA which was nominated for Berlin talent campus, and THE JOURNEY SO FAR. His goal is to produce documentaries and films that will impact positively in Nigerian communities and receive extensive local and international media exposure and interest from film festivals around the world. Ike Osakwe is a Chartered Accountant and Management Consultant. A graduate of the University of Oxford, he is also an Associate member of the Institutes of Chartered Accountants both for Nigeria and for England and Wales. Initially trained for four years at KPMG Audit in London, he recently retired from GRID Consulting Ltd. – a specialist Aid consultancy that he established in 1986 and which has been recently acquired by DAI Global LLC, a US-based global development company. Ike has over 35 years’ experience in financial, strategic and corporate planning, as well as organisational and financial management systems development, both in Nigeria and internationally. He has brought his vast experience in the dynamics of most major industrial sectors to bear in his work on corporate governance. Ike has held several governments and board appointments and currently serves on the boards of Oando Plc, Leadway Pensure PFA, Notore Chemical Industries Plc., DAI Global LLC., as well as Centre for Communication and Social Impact. He previously served on the boards of Oando Marketing Plc. and Red Star Express Nigeria Ltd; and chaired the Boards of Thomas Wyatt Nig. Plc. and UBA Trustees Ltd.
Hadiza is an experienced advocate on women and girl issues, an adviser on Behavioural Change Communication (BCC) Programming, facilitator, instructor and professional in community mobilization. With expertise in voice and accountability programs and specialties in designing programs and activities with particular interest to capture the “hard to reach” and “hard to convince” (HR & HC) social groups. 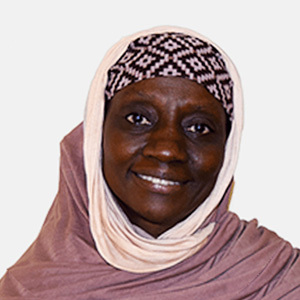 Of significance, Hadiza has facilitated a number of communication, advocacy, research, and mobilization programs. These have included, Ku Saurara! (KS, Listen Up!) Project, where engagement of radio and home video communication mediums were employed. More specifically, she was involved in script writing of 150 episodes of the KS Radio Program; as well as monitoring of 40 community rallies (road shows) in the twelve targeted states; finally also engaged in the facilitation for the formation of youth clubs for married girls in five northern states. Possessing a Masters in Education and International Development Health Promotion from the Institute of Education University of London UK as well as subsequent trainings and work in Health Communications, has enabled Hadiza to develop and coordinate strategic communication activities. Her research has also extended into behavioural surveillance (participation in the Northern Clusters, Behavioural Surveillance Survey on HIV/AIDS and Sexuality (1999 conducted for FHI-USAID). Mojisola commenced her career in Journalism with her earliest training at NBC Training School, Lagos, 1977 and NTA TV College, Jos, 1983. Her love for excellence led her to attend further trainings at Voice of America Training School in 1998, the American Heritage University of Southern California, San Bamadino, USA where she obtained a B.A in Media Studies and then the International Institute of Journalism, (IIJ) Abuja and a Master’s Degree. Moji is a prolific cinematographer with several world-class documentaries in her stable and is an ardent advocate of specialization in formal reportage. She works tirelessly for the uplift of the African woman. Her life mission is to use her field – journalism to contribute to the long-term vision of remaking Nigeria into a model, and to promote an overreaching environment that is capable of shaping National rebirth and character. She was the first President of the National Association of Women Journalist (NAWOJ) to be returned unopposed and was the first journalist to be given the Award of Excellence by the Nigerian Medical and Dental Council. She has received numerous awards to her honour after that; notably is the Most Grateful Awards 2008 for outstanding Reporting of HIV/AIDS Activities in Nigeria, Meritorious Service Award in recognition of Professional Excellence and Service to Humanity, honorary citizenship of Kansas State, and the First Award of Excellence by the Broadcasting Organization of Nigeria -NIBRA. She is a forefront media advocate and has produced several programs and advocacy programs on Maternal and Child Health, Polio Eradication, Health systems promotion, communicable and non-communicable diseases. In recognition of her passion and dedication to excellence, she was the first African to be awarded the Knight Journalism Fellowship of the Centre for Disease Control for Public Health, Atlanta, USA. Moji Makanjuola is a devout patriot as she continues to produce and present Bridges – a program that has been building bridges towards a sustainable Nigeria (over 200 episodes), and topical issues of health- “Health Reports” on the NTA network. She is also an accomplished author whose book ‘Health Journalism – A journey with Moji Makanjuola’ is on the Abuja Literary Society’s Best seller list. Mr. Kareem Tejumola is the Chairman, TNS RMS Nigeria Limited, a world renowned Custom, Social & Market Research Company with a global reach in Asia Pacific, Europe, US, Latin America, West, East & Central Africa. He is one of the founding fathers of market research in West Africa in general and Nigeria in particular. Mr. Tejumola began his career in Market Research as a Statistician with the British Market Research Bureau in 1963. He also worked with Research International London and Research Bureau of Nigeria Ltd. (now Research International) between 1970 and 1980. Mr. Tejumola has a Diploma in Marketing and Statistics from the Polytechnic of Central London, UK. He is a Fellow of the Institute of Statisticians (FIS) and Nigerian Marketing Research Association. (NiMRA). In 1980, Tejumola founded Research & Marketing Services (RMS) in Nigeria, a company that has achieved and celebrated 30 years of reputable business within the industry. He laid the foundation of RMS pre-eminence in Africa and beyond having spanned through Nigeria, Cameroon, Ghana, Senegal, Cote D’Iviore, Kenya, India and UK. Prior to the merger between TNS and Research & Marketing Services in 2011, Kareem Tejumola was the Executive Chairman of RMS. As the Executive Chairman, he was actively involved in new business generation and co-ordination of the Group’s activities across Africa. Tej as he is fondly called has a wealth of knowledge and experience garnered over 30 years of practice in the field of marketing research. In recognition of his role as a global player and in appreciation of his immeasurable contributions to the Market Research Industry and the Nigerian Society, Mr. Kareem Tejumola was in 2010 awarded the ‘Industry Personality of the Decade’ by the Nigerian Marketing Research Association (NiMRA). Kareem Tejumola is a worthy and renowned researcher, an enigma of outstanding personality, a benevolent persona. He is an experienced professional of repute by all ramifications. He is happily married with 5 Children.